Dennis DeYoung defines the Styx sound as “a struggle." “There’s a tension between guitarist James Young and myself on keyboards," he said in a recent interview. “I tend towards the lyrical things, and he likes heavy metal; we have to compromise between my tendency to get cute and his to get mundane. That’s what Styx is all about." DeYoung is one of those few articulate musicians who can put his finger on his band’s identity. Styx, who are performing at the Keystone Arena on Saturday, June 11, are a fusion of light melody and heavy rock. You could say Styx is the best British band to ever come out of Chicago. Like several other rising mid-western bands — Starcastle, Starz and Kansas come to mind — they have borrowed heavily from the English sound. Their twin electric guitar leads are reminiscent of early Wishbone Ash, their excellent harmonies hark back to early Yes, and a Styx tendency to introduce songs with acoustic guitar-picking, smashed by power chords, is straight out of the Who. Styx have labored long and hard to reach the position in the rock hierarchy they now hold. The band toured for six long years, backing everyone and their dog before their own reputation took off with the album Equinox. Equinox established the band with hits such as Lorelie, Light Up and Suite Madame Blue. Crystal Ball, the next album to be released, solidified the band’s reputation. Crystal Ball has been well-crafted. DeYoung and guitarists Tommy Shaw and James Young are all accomplished musicians who build each song carefully into a musical statement. The musical ideas are logical and well-developed. Rather than packing the album with short cuts, they worked on seven songs, each with a duration of four to five minutes. They give themselves the time to work through the theme of the song, and to let the contrasts — the slow and fast portions of many of their songs — sink in. Crystal Ball, the title cut, combines all the ingredients. It features clean dual-guitar work, a synthesizer solo, the three-way Styx vocals, an urgent refrain coupled with longing lyrics, and slower passages. Crystal Ball is an assertion of the band’s own, rather than a borrowed sound. They are moving towards a synthesis of heavy-metal and baroque. If Styx can deliver on stage what they promise in their albums — they have an excellent reputation as a touring band — it should be a memorable show. One criticism of their performances has been ear-splitting noise levels. Earplugs might be advisable as a precautionary measure. The first act on the bill will be Toronto’s Max Webster — the same band that warmed up Rush’s concert last October. Musically, Styx needn’t worry about being blown off the stage. Max Webster shows little imagination in their music. It’s basic ground-thud with a few bright moments. Max Webster’s strength lies in lyrics and stage antics. They are all quite bonkers. Lead singer and guitarist Kim Mitchell struts about like a gaunt rooster under the shade of flashy sombrero, pirouetting into a cocoon of guitar wires before uncoiling himself. He’s been described as a six-foot-two inch, 120-pound praying mantis in Italian underwear. Their lyrics are written by unseen band member Pye Dubois, a psychiatrist in Toronto. 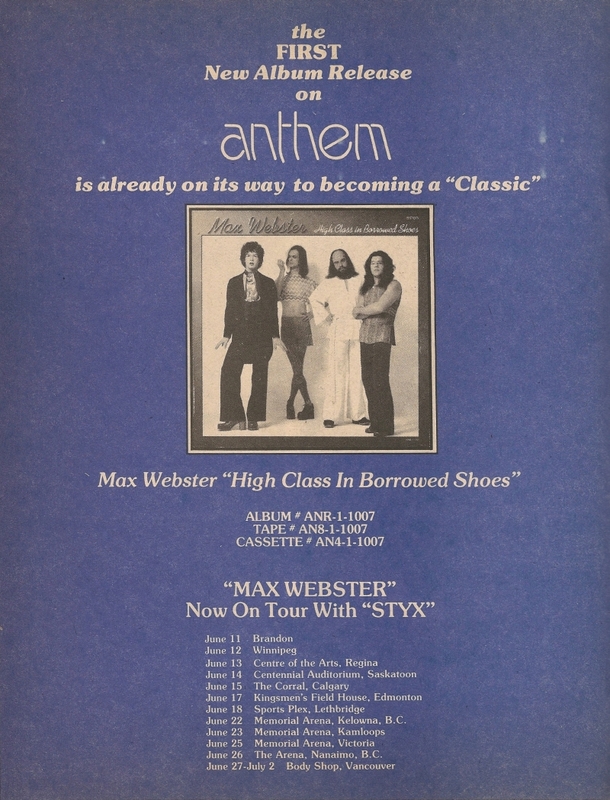 Max Webster records on the new Anthem label, a company owned principally by the members of Rush.